The light, color and atmosphere in the Mediterranean Basin have been an inspiration to artists throughout the centuries. The Marchutz School offers students a unique opportunity to study in the rich artistic environment of Aix-en-Provence, land of Paul Cézanne. And yet, the school is not based simply on one artist, one place, one personality, or one culture. Founded in 1972 by a group of international artists, the Marchutz School's core curriculum has evolved out of these artists' astonishment at the intriguing beauty of the visible and natural world, and their awe at the innovative freshness that can appear in a student's work after one long look at, for example, an African mask, an ancient Greek vase, or a John Constable sketch painting. In other words, these founding artists realized that by examining common threads throughout history among artists from diverse backgrounds, while simultaneously sharpening their own visual language through intensive studio practice, students were able to imbue their work with a sense of both the present and the past, the contemporary and the traditional. At Marchutz, students are encouraged to open their eyes to the present moment and to connect their vision to the art of the past. Cézanne himself noted: "One does not put oneself in place of the past, one only adds a new link." The fundamental principle of the Marchutz School is simple: the synthesis of sight (a perception of the world) and insight (a perception of art) can be the precursor to fresh, original painting. It can be the springboard to a new concept. At the Marchutz School students are asked to perceive as much as they possibly can from masterworks of the past, to discuss these perceptions in an open forum, and then, paradoxically, to let go of this knowledge during the act of looking and painting. Students at the Marchutz School draw and paint - every day if possible. They work from models: children, musicians, dancers. They draw and paint in the fields of Beaurecueil, at the base of Mt. Saint-Victorie, and from the architecture in Aix. They draw from sculpture in the Cathédral Saint-Sauveur, the boules players in the parks, delicately-arranged still life scenes in the studio, the Celto-Ligurian sculptures in the Musée Granet. They draw and paint from reproductions of masterworks. They paint portraits of each other as well as their host families. During this process students may search for a formula for a perfect painting or drawing -- "une belle formule." Their instructors gently inform them that no such formula exists. Students are asked to work directly from nature and to work quickly, letting spontaneity, imagination, and their direct sensations form their images. Soon the young artists discover, among other things, that trees are not green and faces are not pink. The world is made from red and green, blue and orange, yellow and violet, all fused together. Writer Annie Dillard personifies the feeling of observation that Marchutz students experience during these months of intensive visual investigation: "There is a kind of seeing that involves a letting go. When I see this way I sway transfixed and emptied... my own shutter opens, and the moment's light prints on my own silver gut. When I see this way I am above all an unscrupulous observer." Little by little, the students' painting and drawing discipline becomes the center of their lives. They discover new ways to speak about the old truths which have touched them most in the already existing art that they admire. 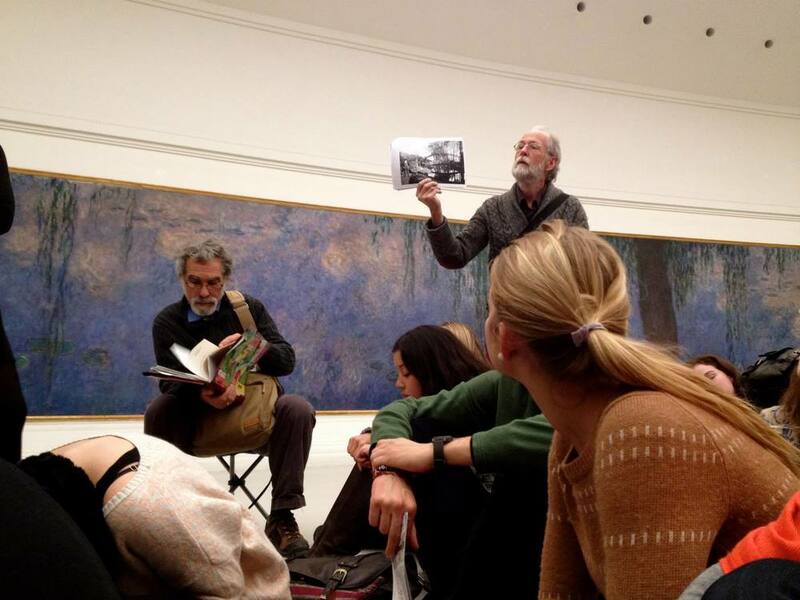 As well as painting every day, Marchutz students are asked to read and compare the writings of artists, critics, and art historians. They are asked to share their impressions and to analyze works of art from all centuries as part of a collaborative dialogue. What do these works share in common? How are they different? What might they mean to us? Artist and founder of the school, Leo Marchutz, believed that through such comparison, "students begin to experience each work of the past as a member of a great family and by doing this one gets a kind of knowledge of how to do it (draw) or how not to do it." Every November, with this great family in mind, the Marchutz School moves out of the light of Provence and into the museums of Paris. Instructors coax students into stopping for long sessions in front of only a few works in each museum instead of walking endlessly through every great hall. Stopping and actually looking - this is no easy task, especially when surrounded by the wealth of art that exists in, for example, the Louvre. But students do stop, and together the cohort may spend two hours in front of Rembrandt's Bathsheba or Monet's Nymphéas or perhaps an Assyrian bas-relief. After a while the group begins to see into the work rather than simply glance at it. It is as if they enter into an intimate dialogue with the artist who created the work. They begin to understand the artistic decisions of the particular artist through direct contact with the work. In the museums, Marchutz School students develop what T. S. Elliot calls the "historical sense" : "The historical sense, which is a sense of the timeless as well as the temporal is what makes a writer traditional. And it is at the same time what makes a writer most acutely conscious of his place in time, of his contemporaneity." Museum experience changes students' capacity to see and affects positively their attempts to create art when they return to Aix. In the spring the Marchutz School takes a ten-day painting excursion to Venice. Here students find a new set of inspirations as well as problems, not the least of which that no other place in the world has been painted, photographed, printed or filmed more than Venice. Students paint quickly, breathing in and observing the essence of the city rather than the conventional image they have seen. Students at the Marchutz School return from Venice imbued with a deeper connection to their particular view of the world and with a new sense of the multiplicity of colors in different environments. The town of Aix-en-Provence, the educational legacy of Leo Marchutz, the present faculty's 35-year collaboration in the studio and landscape, as well as their profound experiences in the museums and cities of Europe, are the invaluable assets that help inspire art students to reach beyond their normal expectations and find a new path toward self discovery and the ability to see.